Working as a hospice chaplain taught me many things about life and death in America. I learned that most of us don’t spend much time reflecting upon our lives until we’re at the end of them and even then, many of us avoid self-reflection. In 2015, frustrated with what often felt to me like a lack of personal engagement with terminally ill people I decided I wanted to take some time to study more fully the thoughts and ideas of people about end of life and I proposed a period of research to measure that important time in life. The Louisville Institute was generous enough to provide funding for this study through their Pastoral Study Grant and throughout the winter and spring of 2016 I conducted surveys and researched end of life matters and the ways people address them. As a result of this work I was led to create an opportunity to facilitate this kind of reflection for people. 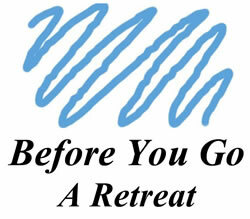 Before You Go is a one day retreat experience meant to focus your attention on certain aspects of your life as well as what is important for you to complete or address before it is all over. It is meant to be done in solitude, with seriousness and good intent; but also with a bit of humor and some ease. It is written in a format that I hope is simple to follow and will help you get to a place of deep reflection about your life, what you want in life and what has kept you from having it up to this point. You are invited to download the PDF file for your use. Please read the Introduction for more information and decide if this retreat format might be something you’d like to use. It’s free of charge and I hope it will bring you a day of retreat, refreshment, and reflection. If you use it, please contact me on my website and let me know about your retreat experience. Thank you for allowing me the opportunity to share my thoughts with you.